The last full day of exploration of Glacier National Park with my group was centered around the Iceberg Lake hike. 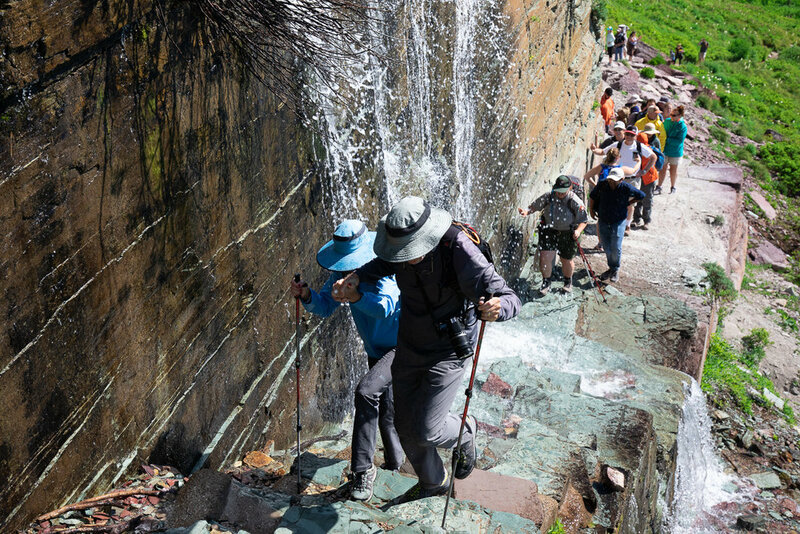 At the beginning of the trail (maybe a half mile in), we noticed about a half dozen people not moving forward. Turns out they spotted a bear in the vicinity. We noticed that it was a bear mom with two cubs. A few minutes of waiting and we proceeded forward with caution. Not more than ten minutes later, we saw another bear mom with two cubs. At first, these cubs climbed a tree but then they walked down. It was unclear what was going to happen with the bear mom protecting her cubs, so our group leader told us to stay back as we let the bears have ample space to cross the trail, if they wanted. At this point, about twenty people were lined up, almost single file, waiting for this bear and her two cubs to cross the trail. We stood patiently waiting, and eventually the bears made their way down the hill. Bears advancing on the Iceberg Lake trail. Photo credit: Steven Werner. Does it look like the bears are smiling as they are coming down? After the morning bear encounter, it was a bear-free walk for the rest of the hike. Scene from the Iceberg Lake trail. Shortly before the trail ends at Iceberg Lake, there is a smaller lake (I believe it is unnamed) where our group decided to rest and eat our picnic lunch. The unnamed lake near Iceberg Lake. Great spot to rest with fewer visitors compared to Iceberg Lake. Views of the unnamed lake. 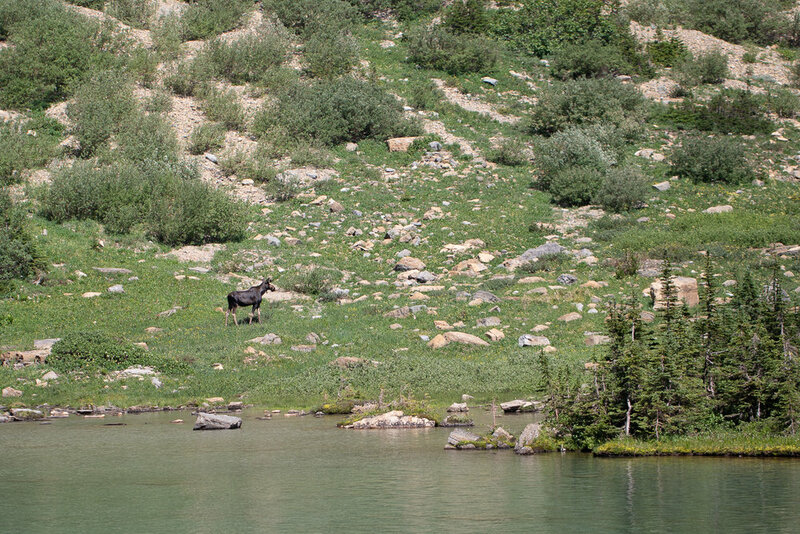 Just prior to arriving to Iceberg Lake, we noticed a mama moose with her calf feeding on the nearby bushes. They were so close to the trail that a ranger had to step in and ask people to stay away at least 25 yards from the animals. A moose and her calf on the Iceberg Lake trail. An iceberg floating in Iceberg Lake. A view of Iceberg Lake from an unmelted snow patch. 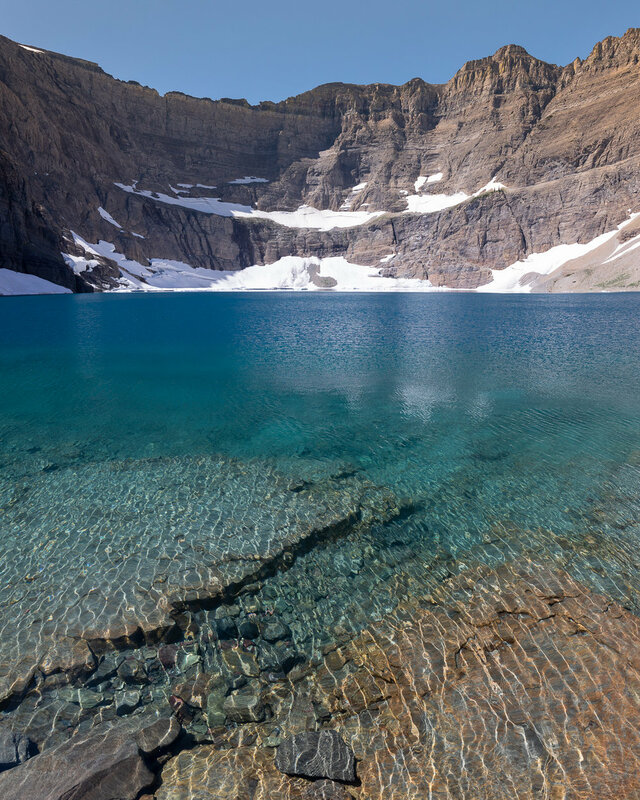 A vertorama (two images stitched together) of Iceberg Lake. Detail of the rock formations in Iceberg Lake. Beautiful wildflowers on the Iceberg Lake trail. The Glacier blog series is complete. I will probably do a wrap-up post with my favorite images in the future; doing so will also allow me to post some new images which I've had additional time to review and post-process. 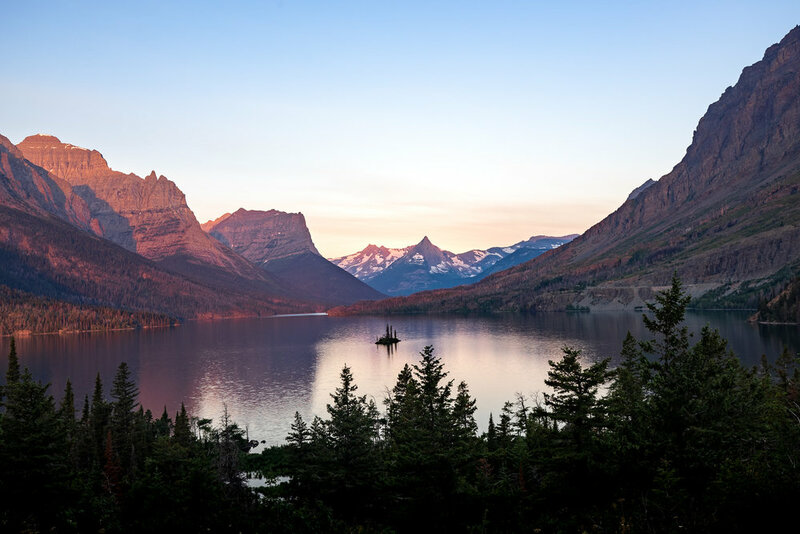 On Day 4 at Glacier National Park, the wake-up call was in the early morning hours (around 5AM) to photograph the sunrise over St. Mary Lake. We were treated to a calm morning with relatively cloud-free skies. Sunrise over St. Mary Lake. Wild Goose Island is visible at the center of the lake. 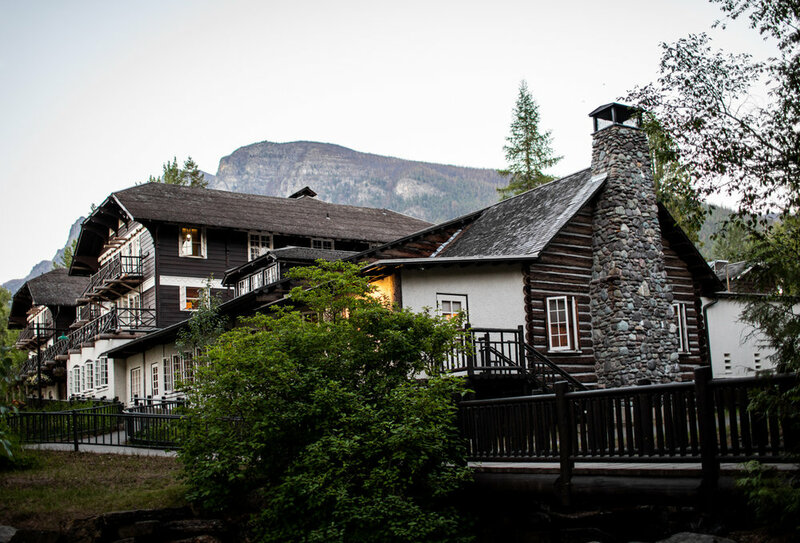 After coming back to our hotel for breakfast, we packed up our bags and continued on our way toward the iconic Many Glacier Hotel, the largest hotel in Glacier National Park. Along the way, we stopped in a massive flower field to take a few photos. My identification of wildflowers is non-existent, so I am relying on this website to help identify flowers (you can narrow your search by location, elevation, flower color, and flower shape). Bigleaf lupine in a flower field at Glacier National Park. There's a metaphor embedded in the image below. Dare to be different, perhaps? Don't be afraid to stand out? A lone blanket flower is seen among the lupines. Source. An RV on its way to Many Glacier region of Glacier National Park. After a great dinner inside the Ptarmigan Dining Room (dinner menu here) of Many Glacier Hotel, we had the evening to relax. I took some time to edit photos from the past couple of days and then stepped out on the balcony to catch the fleeting light. 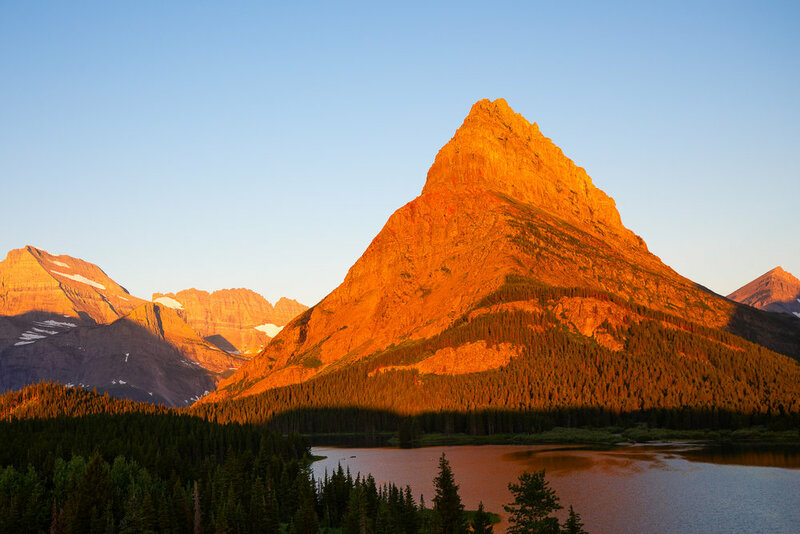 Last light over Swiftcurrent Lake and Mount Grinnell. The highlight of the third day in Glacier National Park was driving over the Going-to-the-Sun Road to the Logan Pass trailhead. 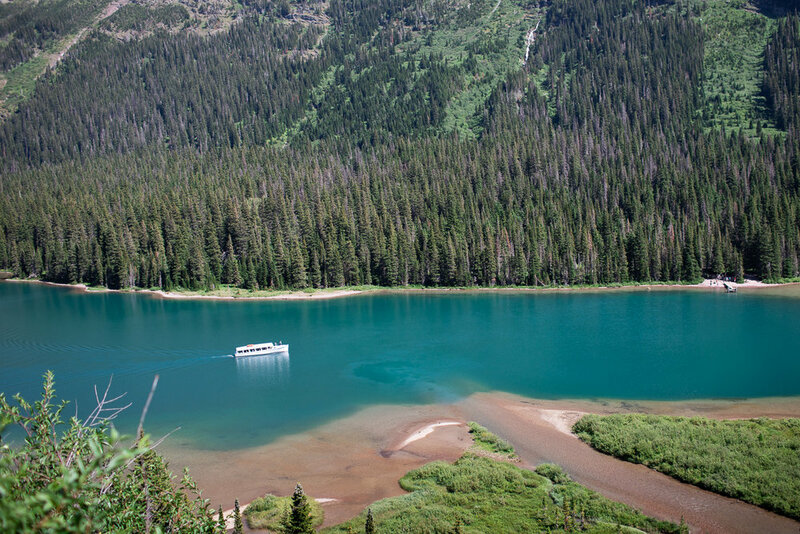 From this location, it was a moderate hike to the top overlooking Hidden Lake and Bearhat Mountain. The view from the top was incredible. View of Hidden Lake and Bearhat Mountain. The long trek to Hidden Lake begins. After a long wait, everyone's favorite mountain goat makes its appearance above Hidden Lake. 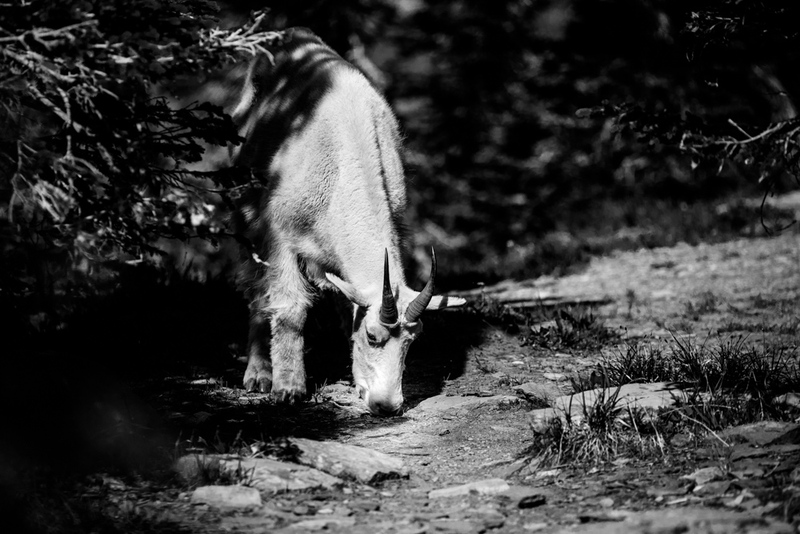 The mountain goat found something interesting near these rocks. A mother mountain goat (a nanny) and her baby goat (a kid). Grizzly bear seen from a distance. Grizzly Bear sighting at the Logan Pass trailhead in Glacier National Park. 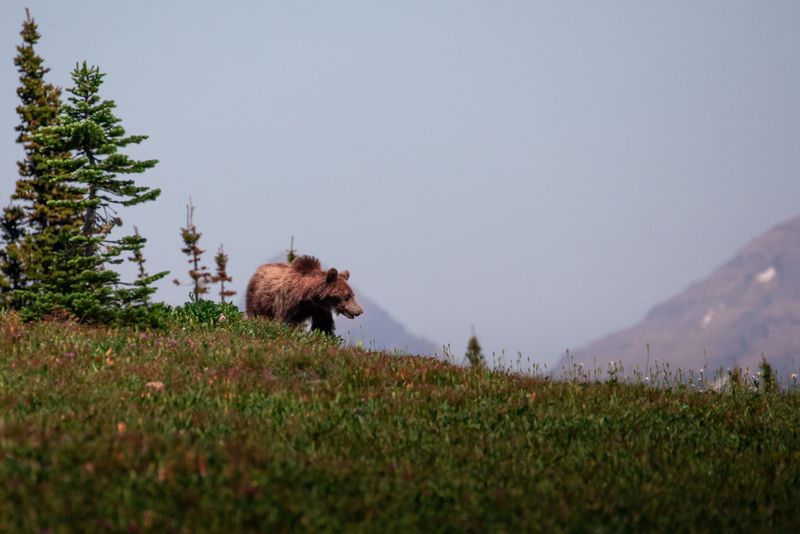 It was a safe grizzly encounter and the rangers at Glacier National Park did a great job keeping people safe and letting the grizzly bear pass through without any issues. After lunch at Logan Pass, we got back in our vehicles and drove back to St. Mary Lodge. After dinner, we departed for an evening photo session with nearby waterfalls. 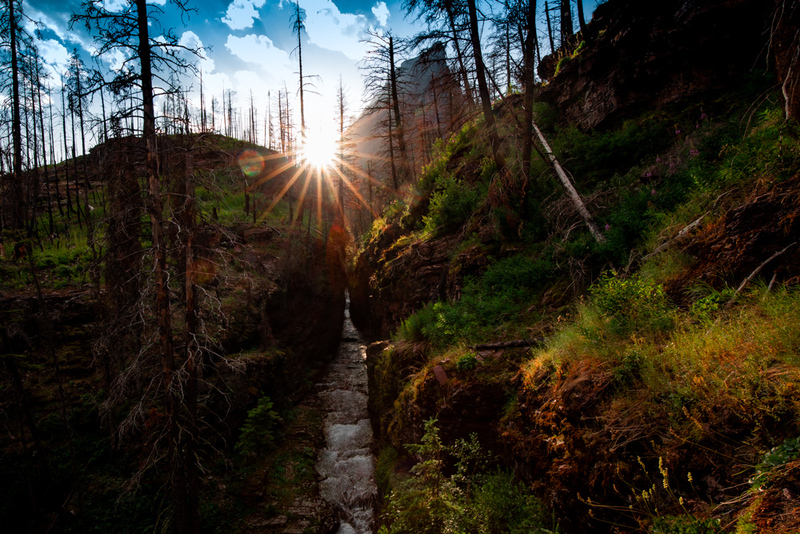 The sun peeking through at Glacier National Park. Contrast at St. Mary Lake. 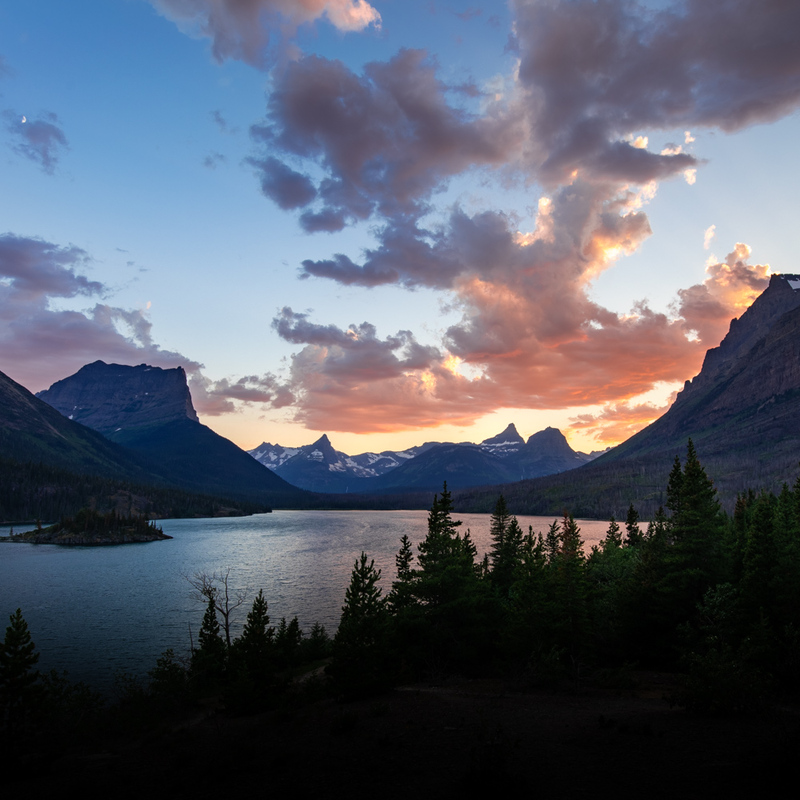 Sunset over St. Mary Lake at Glacier National Park. Note the crescent moon in the upper left corner. I am currently in Glacier National Park in Montana, visiting this park for the first time. The cell service and Wi-Fi here are spotty or non-existent, but I will try to provide some updates from my trip on this blog. Today (Day 1): I drove up from the Flathead Valley region toward the West entrance of Glacier National Park. I took an afternoon hike toward Avalanche Lake (about 4.5 miles roundtrip), which I completed in about two hours. 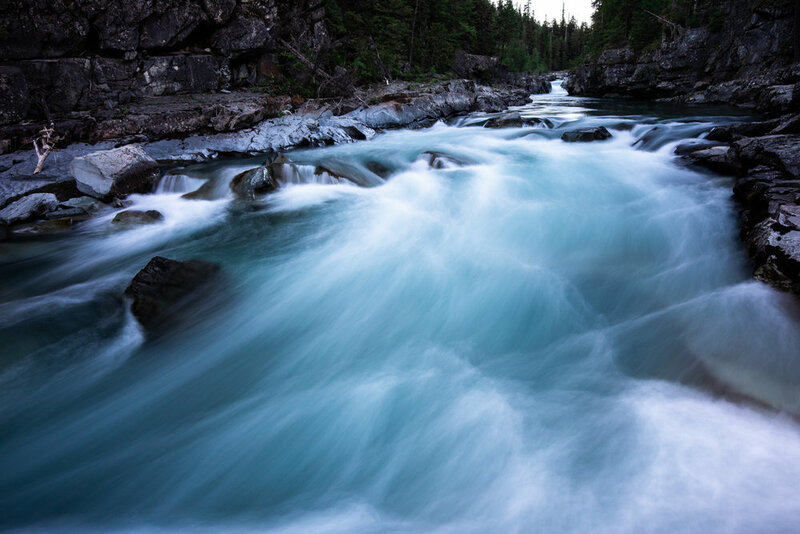 In the evening, the group with which I am traveling stopped near the Avalanche lake trail to capture some long exposure images of Avalanche Creek. Avalanche Creek in Glacier National Park. Wildflowers growing near Avalanche Creek. Home for the night: Lake McDonald Lodge. Evening light at Lake McDonald in Glacier National Park. 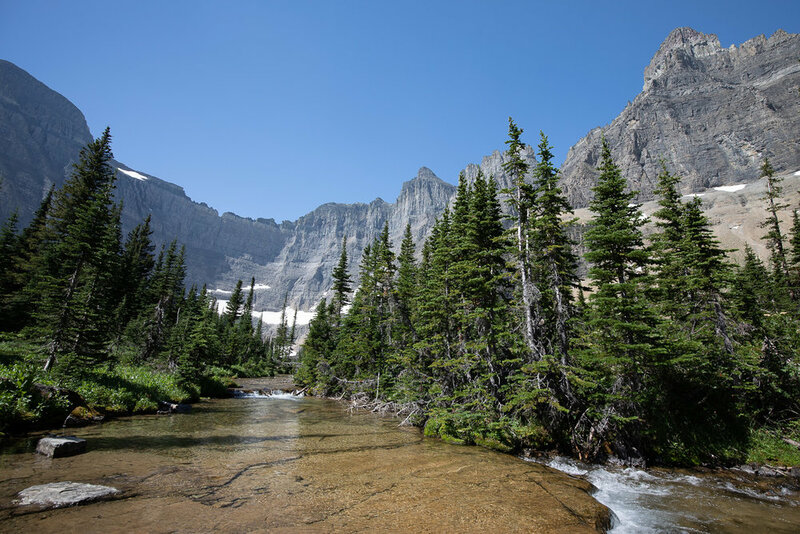 More photos to come from Glacier National Park as I edit them while on the road. Departing from Kennebunkport, the next stop on the road trip to Maine was Ogunquit. This small town is known for its beaches and seascape views. Ogunquit (pronounced "Oh-gun-kwit") means "beautiful place by the sea" in the indigenous Abenaki (Native American) language. A few photos from this sea-side town are below. Walking in Ogunquit. The main beach on the Atlantic Ocean is beyond the tree line; here, people are enjoying the little cove next to Beach Street. View of the cove across the Beach Street bridge (far right). Detail on an Ogunquit storefront. Ice cream stores are very popular in the summer time in Maine. Rose Cove Restaurant in Ogunquit, ME. This is where I had lunch. Recommended lunch meal: fish tacos. The Bread & Roses Bakery in downtown Ogunquit. Recommended stop for tasty treats and/or coffee. A lot of pride in Maine. 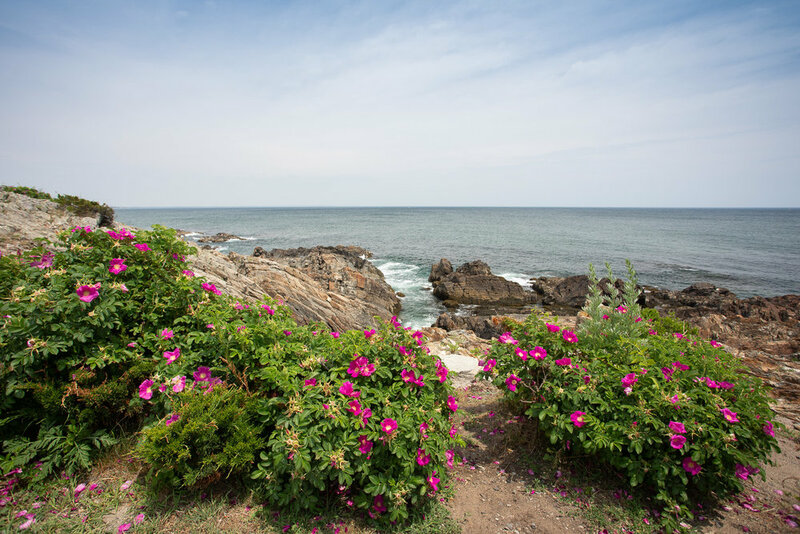 If you make your way to Ogunquit, ME, then Marginal Way is a must-see destination. Marginal Way is one of New England's only paved (and public) shoreline footpaths. It spans a little more than a mile long, connecting Ogunquit Beach to Perkins Cove to the south. Incredible sea views abound on this stroll. There are multiple entrances to the Marginal Way path, including one that leads to a "secret" beach. The land for Marginal Way was donated to the town of Oqunquit in 1925 and a non-profit organization was set up in 2010 to protect Marginal Way for future generations to enjoy. One of the entrances to get to Marginal Way. A view from Marginal Way in Ogunquit, ME. Paddleboarders enjoying the Atlantic Ocean in Ogunquit Beach. A tree grows on the Marginal Way path. If you want to avoid the hustle and bustle of central Ogunquit Beach, head about a half mile on Marginal Way to discover this "secret" beach. Flowers are plentiful on Marginal Way. Gorgeous. From center of town, I drove a few miles south toward a picturesque area of town nestled on Perkins Cove. Here, there are quaint shops and a wonderful drawbridge with amazing views in both directions. Walking up the Perkins Cove drawbridge. View from Perkins Cove drawbridge toward Ogunquit (looking Northwest). Quaint storefronts in the Sandy Cove part of Ogunquit, Maine. Ending the photo set with a mystery: what is the inspiration/clue behind this CONFIDENCE sign? Is it in reference to someone or some event? If you decide to visit Ogunquit, ME, I recommend parking your car away from the beach (there is $20 parking there and it's cheaper in the center of town; one example: the large lot at Blacksmiths Mall antique store charges only $5 for all-day parking) and walking your way around this town. Walking from center of town to the beach to Marginal Way shouldn't take more than two hours round trip (about three miles), even if you make a few stops along the way. As for dining options: Amore for breakfast, La Orilla Tapas or Rose Cove for lunch, and Backyard or Bread & Roses Bakery for snacks or coffee. During my visit to the Boston area last month, I had the opportunity to take a road trip to Maine. I did some research on towns worthy of a day trip, and settled on visiting Kennebunkport, Ogunquit, and York. In this post, I share some photos from Kennebunkport, the town farthest north of the three. Western Avenue (Maine State Route 9) is the main road in the center of Kennebunkport. 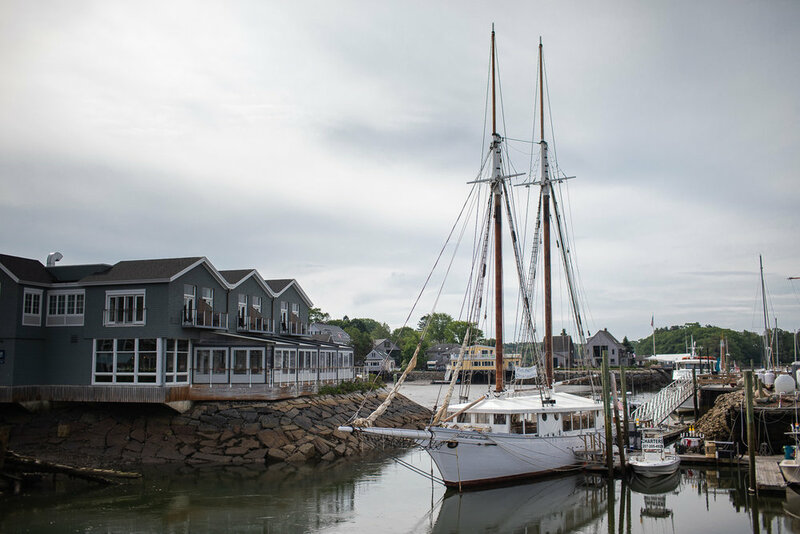 The majority of activity in Kennebunkport is in Dock Square, a colorful jumble of onetime fishing shacks that now house galleries, stores, and restaurants. A beautiful display of flowers in the Kennebunkport town center. Flowers growing inside these ship-shaped "pots" adorn Western Avenue (Dock Square) of Kennebunkport. Colorful sign and American flag. Cruising in style in Kennebunkport, ME. I did not catch the license plate of this vehicle, so am uncertain whether this is a local or a tourist. Morning bike ride and views in Kennebunkport, ME. Harbor views in Kennebunkport, ME. The gorgeous Kennebunkport Inn in the center of town. I would stay here or at least grab a drink in their outside patio. Outdoor patio of the Kennebunkport Inn looks incredibly inviting. Departing from Dock Square of Kennebunkport, I continued driving toward Cape Porpoise Pier. From here, one could see the Goat Island Lighthouse in the distance. At the edge of Cape Porpoise Pier. The Goat Island Lighthouse is seen in the distance. Cape Porpoise Pier in Kennebunkport, ME. Old boats at the edge of Cape Porpoise Pier. If you decide to visit Kennebunkport, ME, I recommend doing a loop around this town. Beginning on Western Avenue and explore Dock Square. Stop by Mornings in Paris for coffee and Rococo Ice Cream (6 Spring Street) for ice cream if you are visiting Kennebunkport in the summertime afternoon. Continue toward Cape Porpoise Pier to take in the views of the Goat Island Lighthouse. Continue the loop toward Blowing Cave Park (there is ample street parking here) to take in views of the George H.W. Bush Compound (summer home) in the distance. Finish your loop back through center of town and check out Snug Harbor Farm on your way back (separate post forthcoming). Suggested itinerary through Kennebunkport, ME. 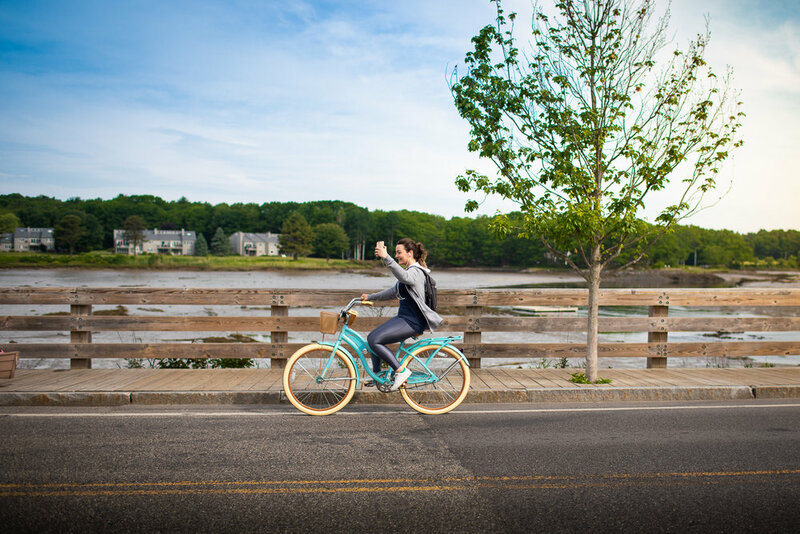 If you've ever been to Kennebunkport, which spots were your favorite and why? I visited Newport, RI in June 2018 and along the way stopped in two of the Gilded Age mansions: The Elms and Rosecliff. I chose these two mansions as I had visited The Marble House and the Breakers about seven or eight years ago and wanted to see a different set of the Gilded Age mansions. This post focuses on the Rosecliff Mansion, which is one of the smallest of the Gilded Age mansions in Newport, RI. The exterior of Rosecliff from the backyard. Rosecliff was built by Theresa ("Tessie") Fair Oelrichs, a silver heiress from Nevada, whose father James Graham Fair was one of the four partners in the Comstock Lode. Tessie was the wife of Hermann Oelrichs, American agent for Norddeutscher Lloyd steamship line. She and her husband, together with her sister, Virginia Fair, bought the land in 1891 from the estate of George Bancroft and commissioned the architectural firm of McKim, Mead, and White  to design a summer home suitable for entertaining on a grand scale. The commission for Rosecliff occurred in 1899, in which principal architect Stanford White modeled Rosecliff after the Grand Trianon, the garden retreat of French kings at Versailles. After Rosecliff was completed in 1902, at a reported cost of $2.5 million, Mrs. Oelrichs hosted opulent parties and displays of entertainment here, including a fairy tale dinner and a party featuring famed magician Harry Houdini. 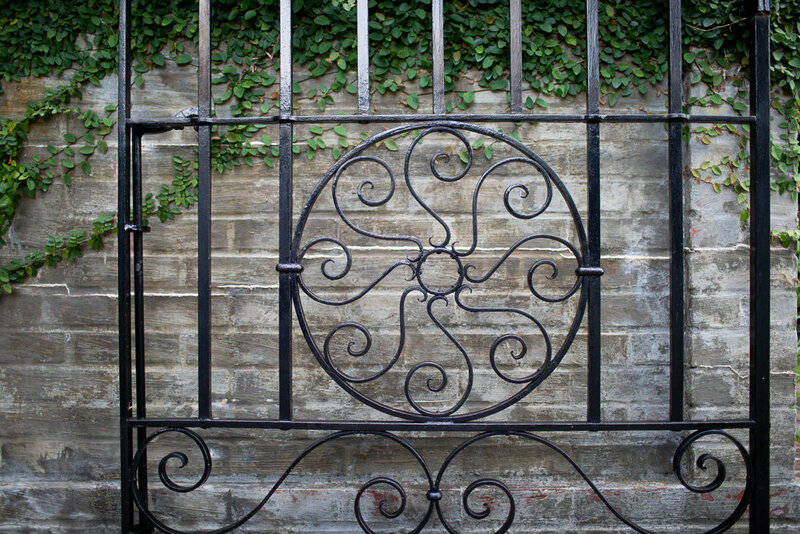 Rosecliff is now preserved through the generosity of its last private owners, Mr. and Mrs. J. Edgar Monroe, of New Orleans. 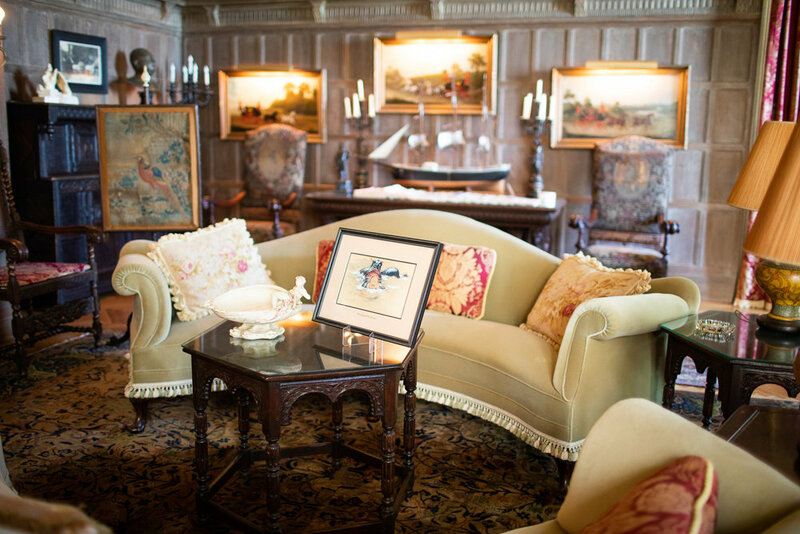 They gave the house, its furnishings, and an endowment to the Newport Preservation Society in 1971. The grand staircase in Rosecliff. Note how the architectural design of the top of the staircase resembles a heart. Another view of the grand staircase at Rosecliff. A grand piano in the ballroom. "The Sea Monster" depicted in one of the framed photos. A vase in a hallway between two rooms. Detail from one of the windows at Rosecliff. Books and candles on an elegant marble table. During my visit to Rosecliff, there was a special exhibition on Bohemian Beauty and Oscar Wilde's visit to Newport, RI. This exhibition celebrates the ideas embodied by the artists, poets, and thinkers popular during the Aesthetic Movement (1870-1890), an important era of artistic experimentation in the United States and abroad. The exhibition features a selection of furniture, ceramics, wallpaper, glass, silver, paintings, and costumes illuminating the tenets of this “art for art’s sake” movement personified by its most influential impresario Oscar Wilde. One of the ceramic pieces at the Bohemian Beauty exhibition at Rosecliff. The Bohemian Beauty exhibition runs through November 4, 2018 at Rosecliff. The ballroom of the Rosecliff Mansion was used to film scenes for the 1974 version of The Great Gatsby, as well as other films such as High Society, 27 Dresses, True Lies, and Amistad. Rosecliff is one of the Newport mansions that's open year-round. Confirm the schedule here. I would recommend purchasing a ticket to Rosecliff with another Newport mansion, as you'll save some money doing so. Since most of the Newport mansions are within walking distance on Bellevue Avenue and don't take more than a couple of hours to explore, it's a good idea to see two mansions in a single day. The McKim of McKim, Mead, and White is the architect behind The Boston Public Library. I spent four days at Myrtle Beach with my parents over the Independence Day holiday (July 4th). The time near and in the ocean was fantastic (great weather, warm water temperatures, and not as crowded as some beaches I've been to in the past). On our last day, we made our way south to visit Brookgreen Gardens. I hadn't heard of Brookgreen Gardens before--the place was recommended to us by my parents' neighbors, who frequent the Myrtle Beach area twice a year. 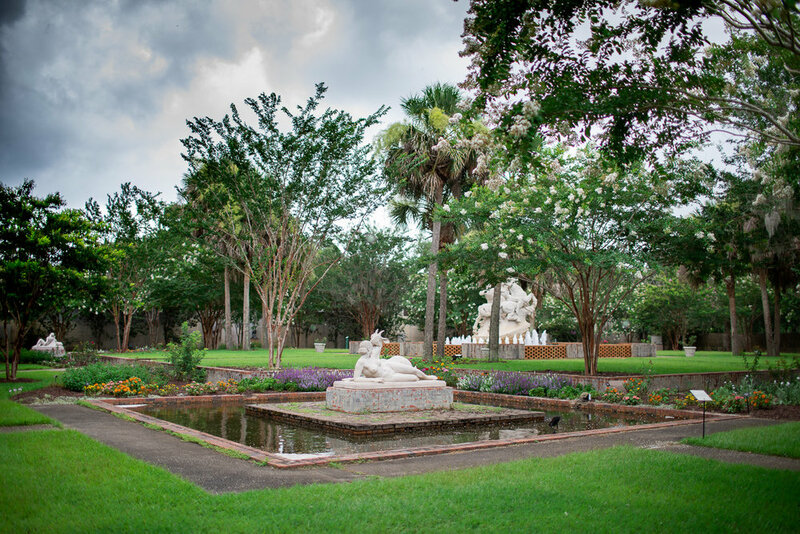 Brookgreen Gardens is a massive property on 9,127 acres; it consists of a wildlife park, beautiful gardens, and an awe-inspiring collection of sculpture. To put simply, Brookgreen Gardens is a botanical garden within which you may find wildlife and a spectacular art display. A bit of history: Brookgreen Gardens was founded by Archer Milton Huntington, stepson of the railroad magnate Collis Potter Huntington, and his wife Anna Hyatt Huntington to feature sculptures by Anna (a talented artist) and her sister Harriet Randolph Hyatt Mayor, along with other American sculptors. Archer and Anna Hyatt Huntington first visited the property in 1929 and were captivated by it and the surrounding area, purchasing the 9000+ acres. In 1932, Brookgreen Gardens was opened to the public. Brookgreen Gardens was added to the U.S. National Register of Historic Places in 1978. Below are a selection of photos I captured at Brookgreen Gardens. The spectacular Live Oak Allée. Live Oak Allée. In the background: Edward Francis McCartan's statue of Dionysus. Native orchids growing at Brookgreen Gardens. 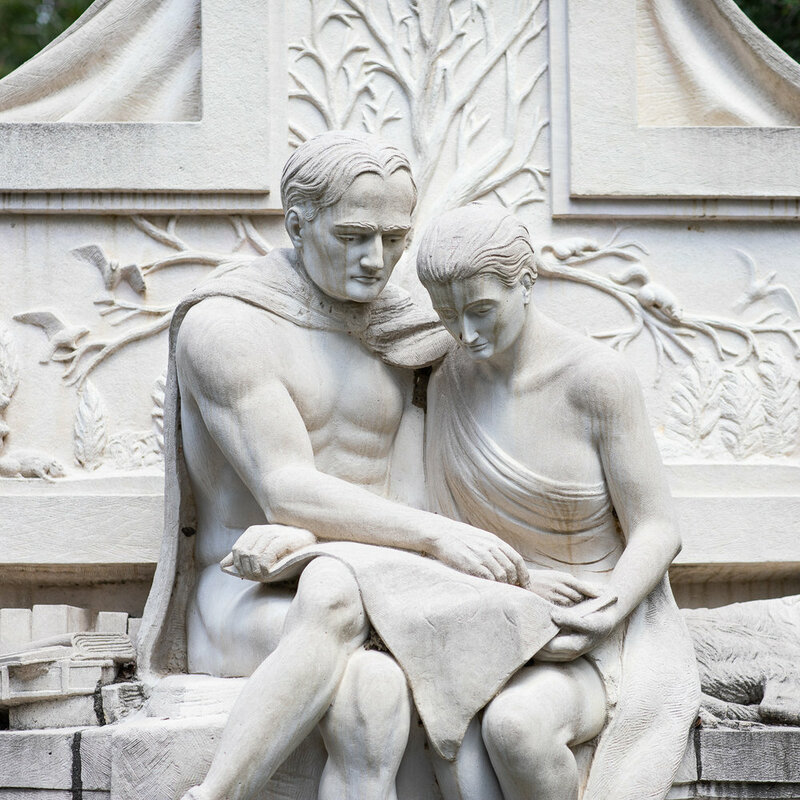 About 1445 works of American figurative sculpture are displayed at the Archer and Anna Hyatt Huntington Sculpture Garden at Brookgreen Gardens. 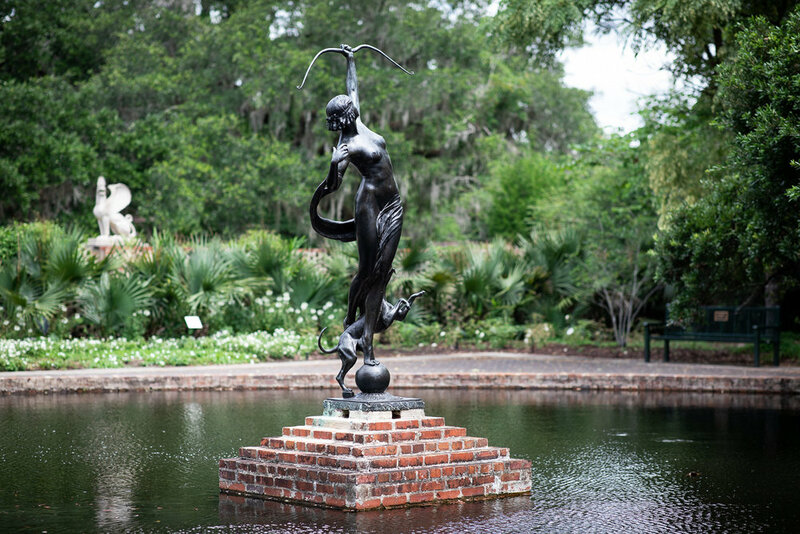 Overall, there are over 2,000 works of sculpture at Brookgreen Gardens, when including certain sculptures that are located indoors. The Brown Sculpture Court, seen below, is reminiscent of the Moorish architectural designs and reminded me of the interior courtyard of the Alhambra. Brookgreen Gardens is a spectacular destination and a must-see stop if you're in the Myrtle Beach area. If you get a chance to go on the hourly guided tour, I highly recommend doing so, as you will get an excellent history lesson of the grounds as well as highlights of the top ten to fifteen sculptures within the gardens. During my trip to Israel, I had a chance to visit the WeWork office in central Tel Aviv, Israel. WeWork is a startup founded in NYC, whose business model is to provide shared office space to small companies and technology startups. The most recent investment rounds value the company at $10 billion. I think the business model is fantastic: bringing like-minded entrepreneur types into one co-working space. The Tel Aviv office features three floors of office space, a living room with a kitchen (with free beer! ), and a large shared working area with a number of computers for use. I took some photographs during my visit, which appear below. There is something like WeWork in Atlanta with the Atlanta Tech Village (whose monthly pitch events I attend), but it would be cool to see WeWork expand to other parts of Atlanta. This week, I was in New York City for a brief business trip. On the first evening of my stay in the City, I took a three hour walk around Midtown Manhattan. One of my favorite stops along the walk was the outdoor exhibit at The New York Public Library. This summer, The New York Public Library is celebrating the excitement and personal joy of reading with the hashtag #ireadeverywhere. We are asking all of you to join authors, librarians and other readers from all over the world to share your favorite — and unusual — reading spots, along with the hashtag and our handle @nypl, all in an effort to inspire others to pick up a book (or an e-reader) and start their own adventures. The famous NYPL lion with the "Read Everywhere" advestisement. The outdoor library room featured carts for a "book swap"—leave one book for others, take one home. The Beautiful Struggle by Ta-Nehisi Coates (not mentioned on the board: Coates's latest book, released in July 2015, Between the World and Me). Walkable City by Jeff Speck (I hadn't heard of this book before, but I've added it to my reading list). Based on the press release, the outdoor reading room just ended on July 17. However, reading never stops. I hope you can find some of these book recommendations helpful. Happy reading!